A few weeks ago, a friend and I visited a Greek bakery in my neighborhood, where we spotted a tray of dome-shaped cookies coated in a shiny chocolate glaze. My friend, who grew up in Athens, had never seen anything like them, and we were both intrigued. The decadent treats turned out to be chocolate-covered melomakarona, traditional Greek Christmas cookies flavored with brandy or cognac, orange juice, and cinnamon, and soaked in a honey syrup. Melomakarona are egg-free and often made with olive oil instead of butter. The combination of chocolate coating and melt-in-your-mouth soft, honey-flavored interior was so delicious that I decided to create a simplified version at home. 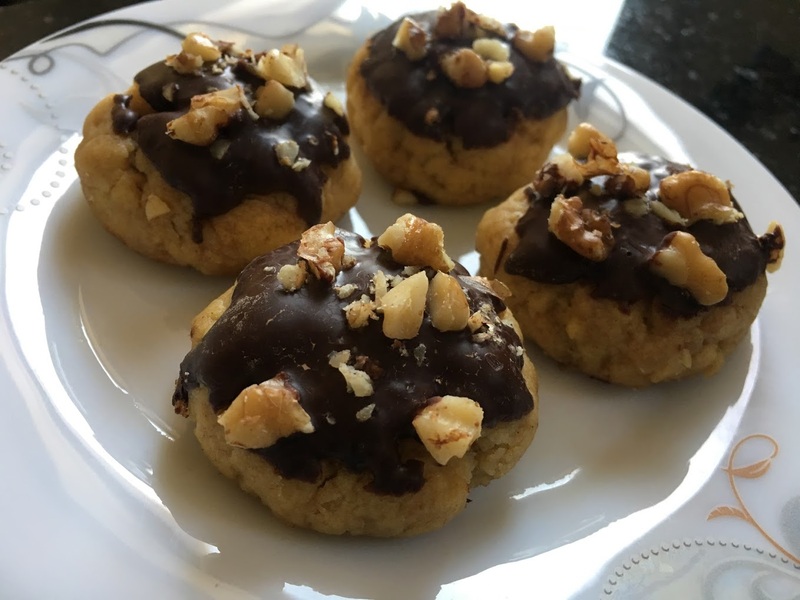 For just the right balance of chocolate, citrus, and honey, I left out brandy and used orange juice as the main source of liquid, brushed the cookies with syrup rather than soaking them until fully saturated, and dipped just the tops in chocolate. A sprinkling of coarsely chopped walnuts adds a nice crunch. Prepare and bake the dough: Preheat oven to 350 degrees F, and line a baking sheet with parchment paper. In a small mixing bowl, combine flour, salt, baking powder, and baking soda. In a large mixing bowl, combine olive oil, sugar, orange juice, cinnamon, and orange zest (if using.) Stir in flour mixture until just combined. Scoop level tablespoons of dough and roll into balls. Place around an inch apart on baking tray and flatten slightly. Bake for 14-15 minutes, until the cookies are golden brown on the bottom and just begin to turn pale golden brown on top. Cool for a few minutes on the baking sheet before transferring to a cooling rack. Prepare the syrup: In a small saucepan, combine honey, water, cinnamon, and vanilla. Bring to a boil on medium-high heat, then simmer for a few minutes until mixture thickens very slightly and turns a deep golden brown. Set aside to cool. Glaze and coat: Brush several layers of syrup onto each cookie using a pastry brush, until cookies are soft but still hold their shape; if they are over-saturated with syrup, they will begin to crumble apart. Set aside for a few minutes until dry, then dip the top of each cookie in melted chocolate. Sprinkle with walnuts, if using, and set aside until chocolate coating sets. Store in an airtight container at room temperature.